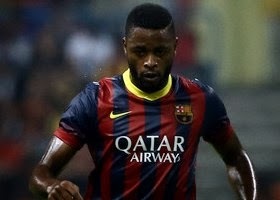 Interesting transfer news are out claiming that Barcelona are inviting offers for Alex Song ahead of next month’s market. The Daily Star claims that Arsenal and Manchester United are on alert with the Spanish champions willing to let the Cameroon international leave the Camp Nou for as little as £10m in the upcoming transfer window. It is said that both the Gunners and United have been waiting to see if the defensive midfielder would be made available for a transfer and according to reports in Spain the La Liga champions are willing to let him leave the club if they receive a £10m offer. “I do not know what will happen in the future,” he said. “But it is true that I spent some fantastic seasons there [at Arsenal].